I custom-designed MySwear shoes on Farfetch! Seoul, Korea dog cafe & Myeongdong Kpop shops. Happy holidays! Tis the season to see friends and family, but don’t forget to take a moment to treat yourself too. 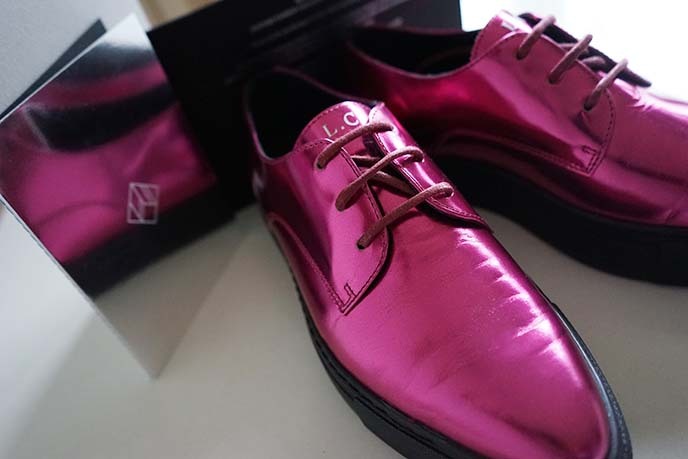 I got an early “me to me” gift… these show-stopping MySwear shoes, which I designed myself! 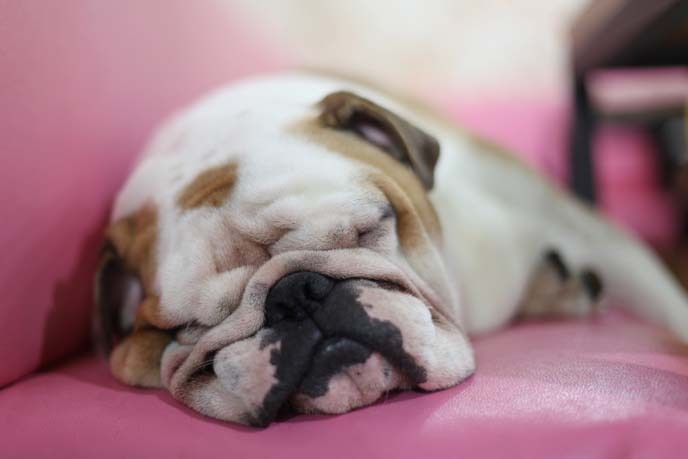 … and take you inside the dog cafe in Seoul, Korea: where you can pet puppies of all breeds. Be sure to read until the end, for some Kpop shopping tips too. I’m thrilled with how my metallic bespoke shoes turned out. I got to choose from 16 unisex silhouettes, and then customize every single aspect: color, materials, laces, and more. There’s even the option to add a personal monogram. 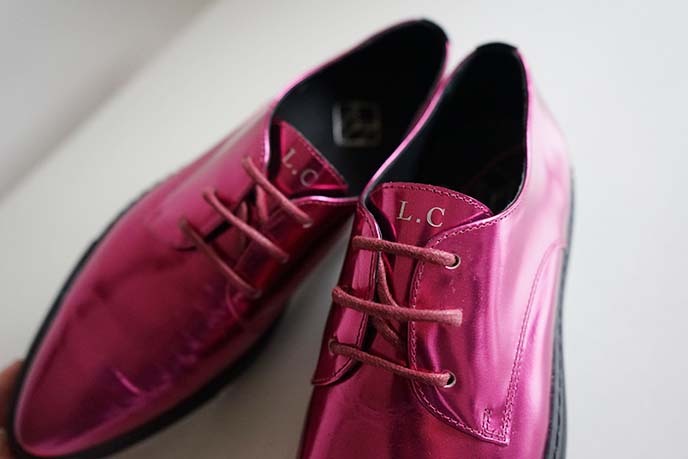 I think these shiny, retro, red-purple Wizard of Oz shoes can only belong to “L.C.” (La Carmina)! 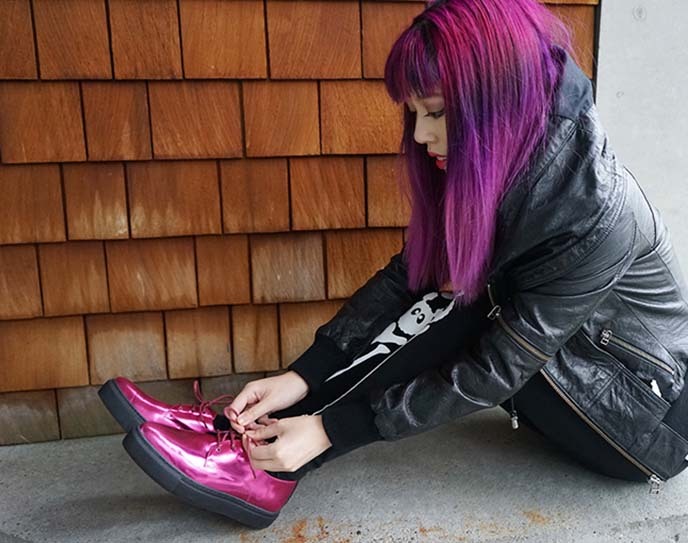 I picked the metallic fuchsia color because it matches my hair color. I love how these MySwear shoes are “100% me”, thanks to the complete customization. 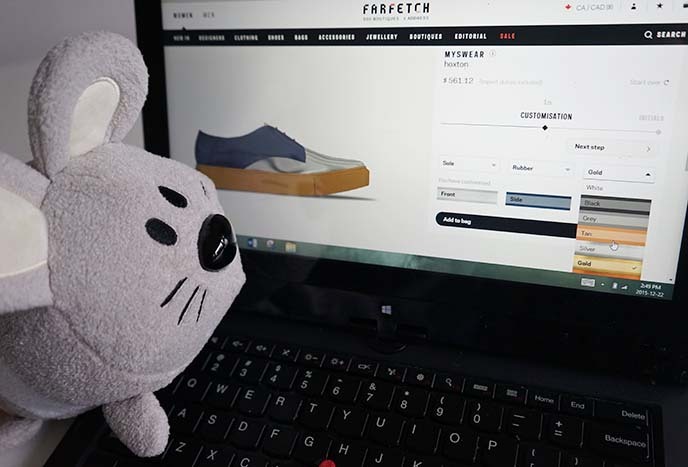 My mouse-friend and I had a lot of fun designing my shoes. We went to the MySwear site, and selected a footwear style. 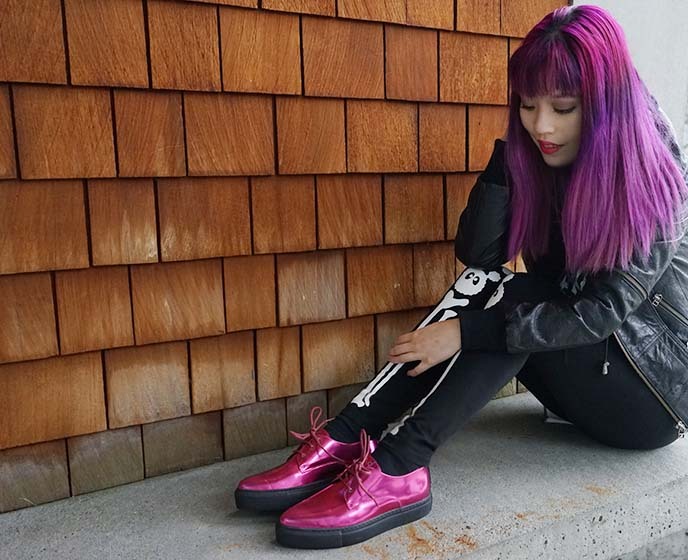 (I went with the minimalist, pointed-toe Hoxton — but you can select platform sneakers, creepers and more). Right on the screen, you can play around with different materials (python, suede, ostrich), color combinations (side, front, panel), soles, and decorations (a metal toe cap, velvet stripe, monogram). When you make a choice, the 3D image updates so you’ll know what the finished result will look like. After you send in your design, the shoes are handmade in Portugal with the finest craftsmanship. The turnaround takes about 4-6 weeks, since every order is an original. 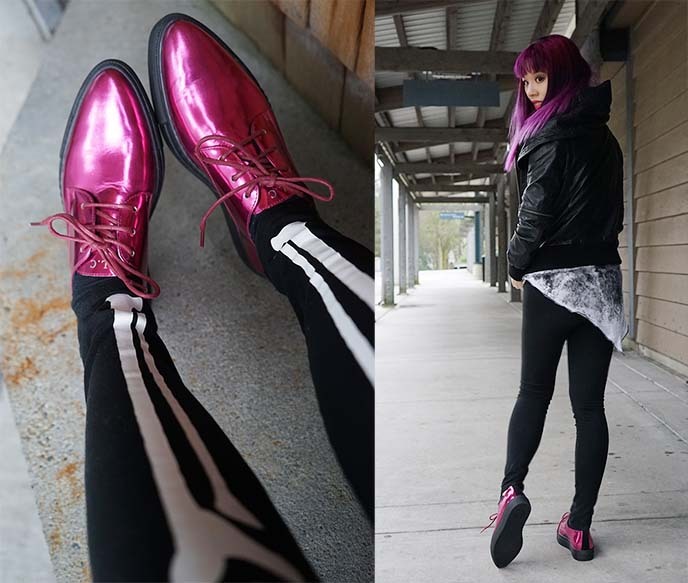 I’m so happy with how the MySwear Hoxton sneakers turned out! They’re one of a kind, and really make an outfit stand out. 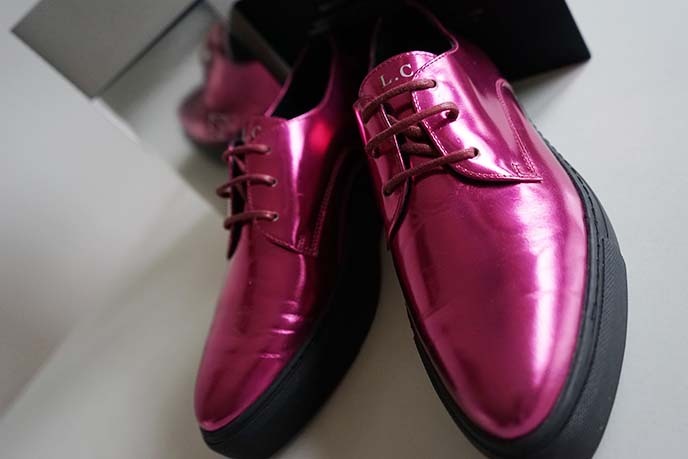 The shoes are beautifully made, with artisan techniques and luxury finishes. I enjoyed seeing how other creators let their personalities show, through their bespoke designs. You can see more examples on social media under the hashtags #farfetch and #farfetchfind. I’m curious to know — how would you customize your own MySwear shoes? Since we’re wrapping up 2015, I figured it was time to publish my last photos from Seoul, Korea (I went there last year, but never got around to sharing these). I spent an afternoon in the Myeongdong shopping district, which is packed with Kpop shops. I also went to the dog themed cafe, where you can drink coffee and pet dozens of puppies! 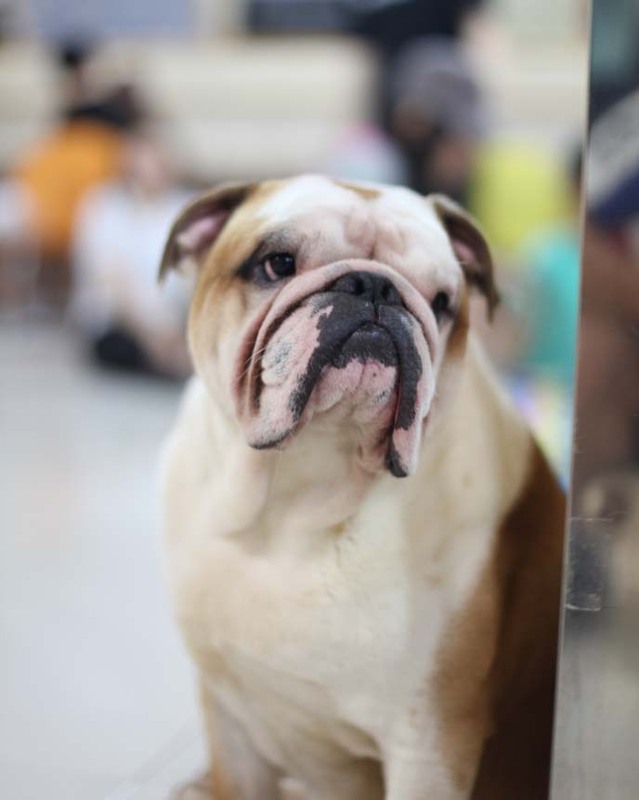 Seoul has a few “dog cafes” where you can enjoy the company of canines, of all breeds and sizes. How many can you count in this photo? 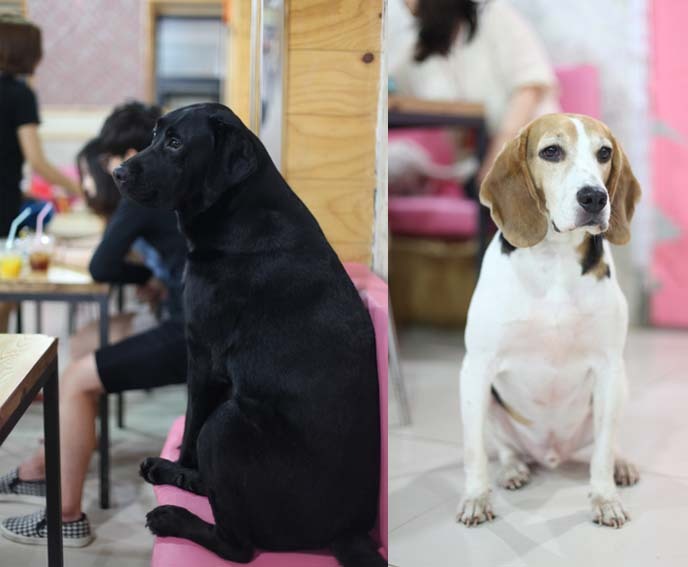 I planned on visiting the original dog cafe, Bau House, in Hongdae. 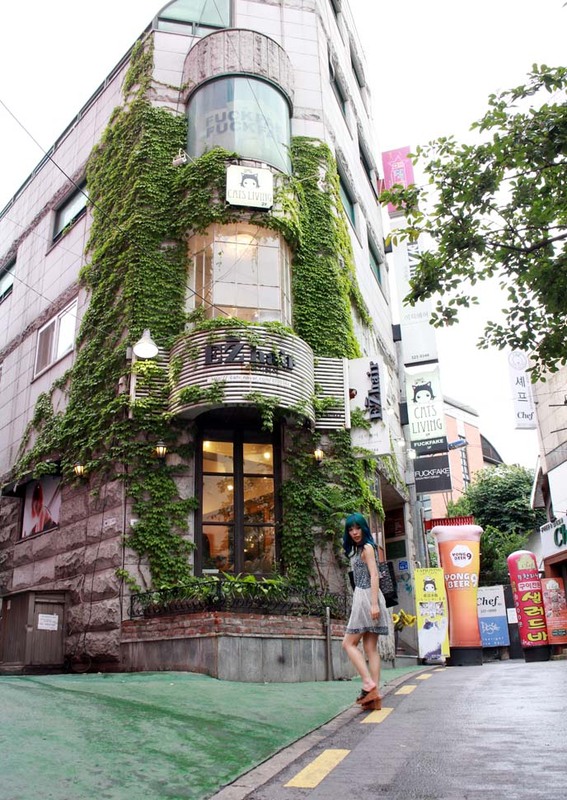 However, it moved locations (Bau House is now found near Hapjeong Station — the address is Jeil Bldg. 1F, 394-44 Seogyo-dong, Mapo-gu, Seoul). I found myself in a room filled with dozens of adorable dogs! I went straight to the big white Great Pyrenees and gave him a hug. 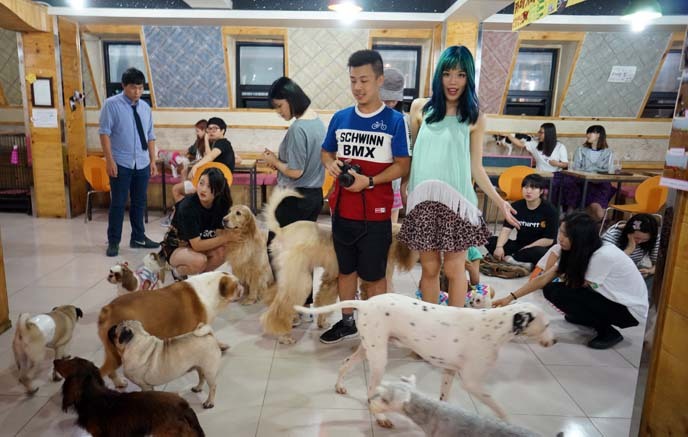 Entrance at Gaene costs about 8000 won ($8 per person) and includes a drink, plus unlimited time to pet the pups. Before the staff sets you loose, you must sanitize your hands, and turn over any chocolate that you might be carrying (as it’s poison to both cats and dogs). 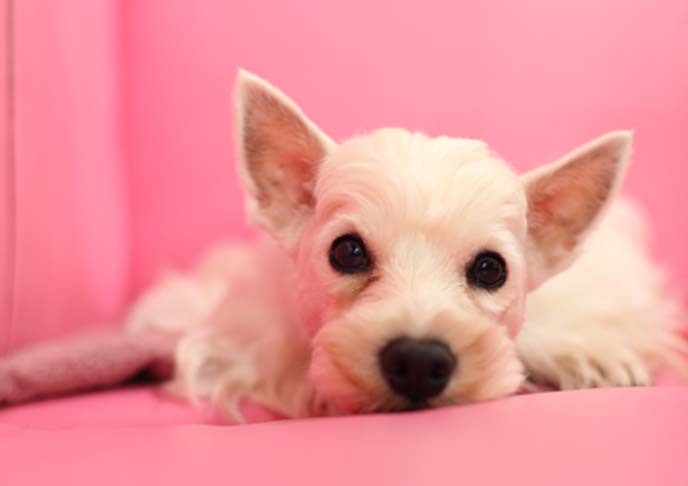 There’s a breed for everyone: terrier, bulldog, collie, Afghan hound. Non-flash photography and video are allowed, and many Korean girls took selfies with the animals. I saw children sitting on the floor, with blankets provided by Cafe Gaene. They combed the lapdogs and arranged ribbons in their fur. As you know, I’m a cat-mom but I love dogs too. It was fantastic to be able to play with so many breeds, in a single space. 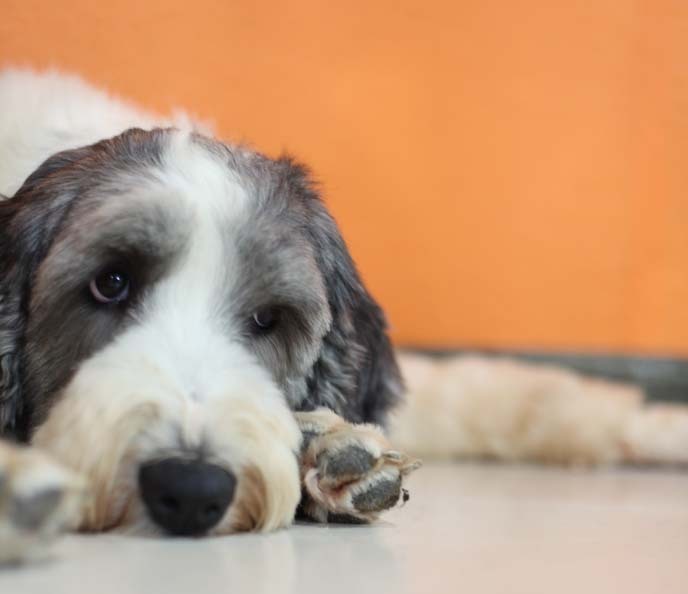 All of the dogs were well-behaved, and seem healthy and happy. A few got into “barking matches” and scuffled on the floor, but for the most part, everyone seems to live together in harmony. 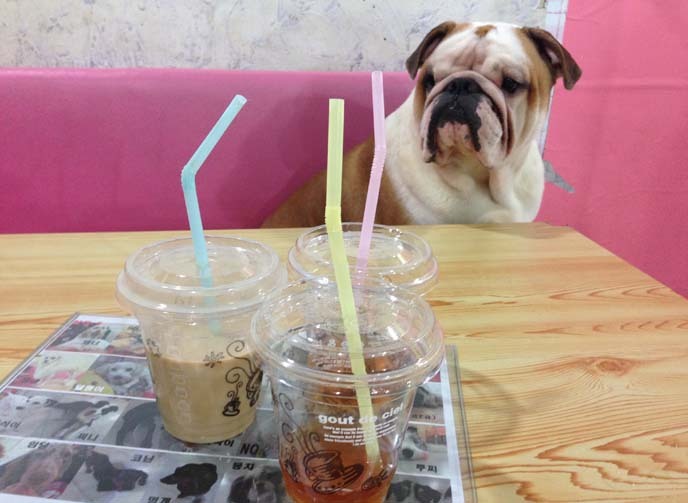 Seoul’s Cafe Gaene is a unique “only in Asia” experience, and good times for dog lovers of all ages. Let’s end with a look at fashion in Seoul. 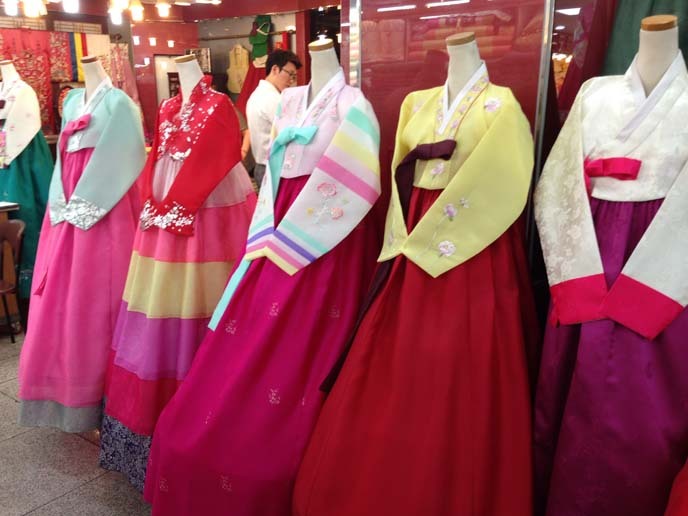 All over the city, you can find stores selling hanbok: traditional silk and satin dresses, with tiers of rainbow colors. 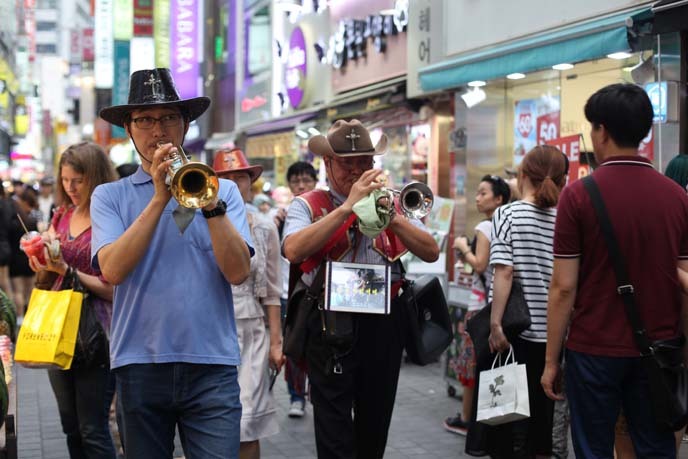 Myeongdong is the neighborhood for you. 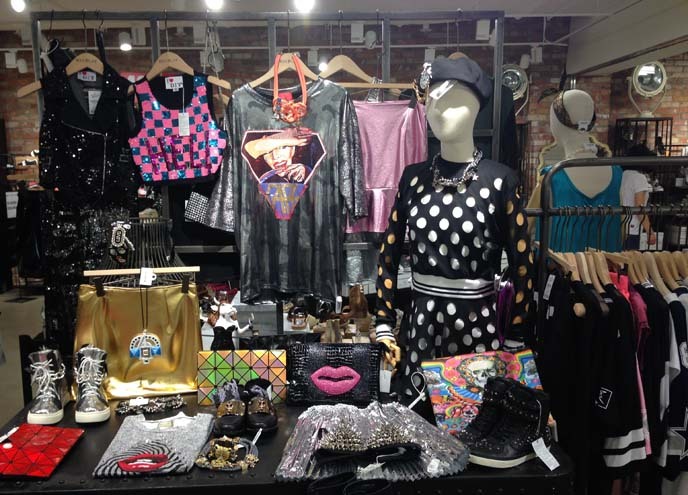 The streets are filled with bright Kpop and streetwear boutiques, in addition to big-name international brands. 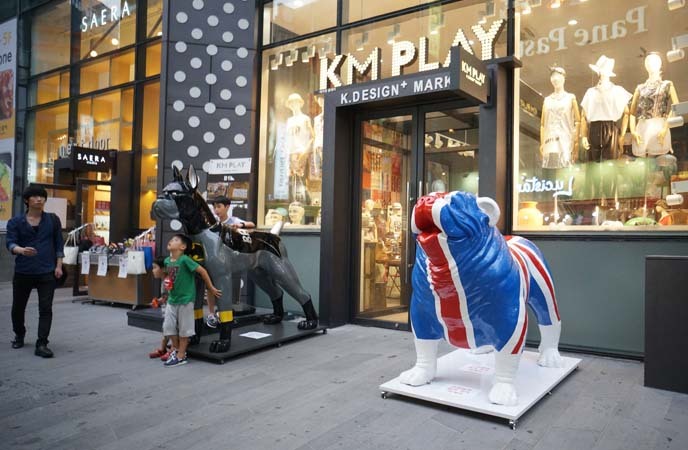 I said hello to a Batman-dog, outside the KM Play / K.Design+ mart. These cheeky statues hint at the eccentric clothing and accessories inside. K-pop style has become popular worldwide now. One of the hottest places to get dressed is at KM Play. I saw Simpsons-print tops, studded ankle boots, oversized sporty shirts, glitter skirts and other K-idol favorites. 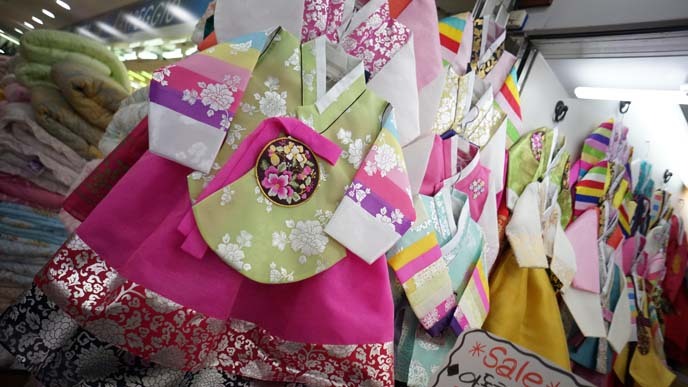 Both prices and quality are mid-range (about 30,000 won or $30 US for a top), and items are mostly unique to the store. Give yourself at least an hour to browse, since the racks seem to go on forever. 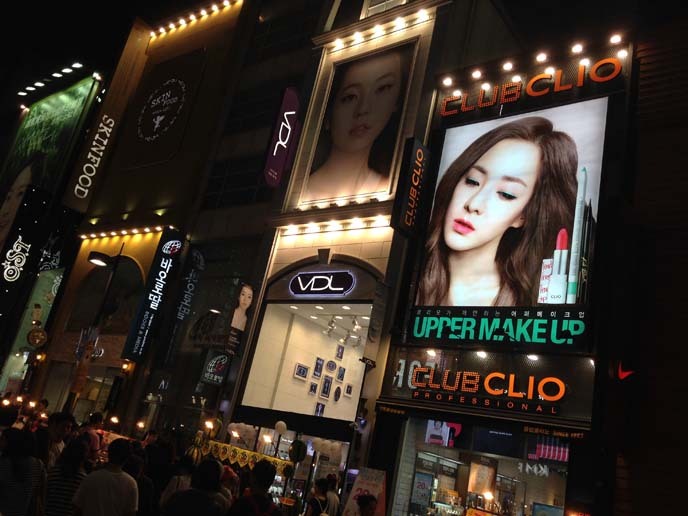 Myeongdong is also filled with Korean makeup and cosmetics shops, including the girly favorite Etude House. I saw big posters of Dara and Sohee, showing the Kpop beauty standard (white skin, flat eyebrows, slim face with a V-shaped jaw). Speaking of plastic surgery — yes, it’s prevalent in Seoul, especially in districts like Myeongdong, Gangnam and Apgujeong (which has a whole street of clinics). Advertisements are everywhere, sometimes showing “before” and “after” faces. 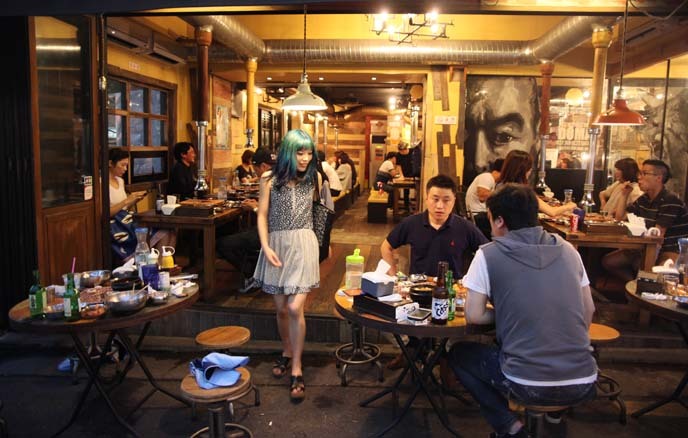 Hongdae remains the indie, artsy center — and my favorite district of Seoul. 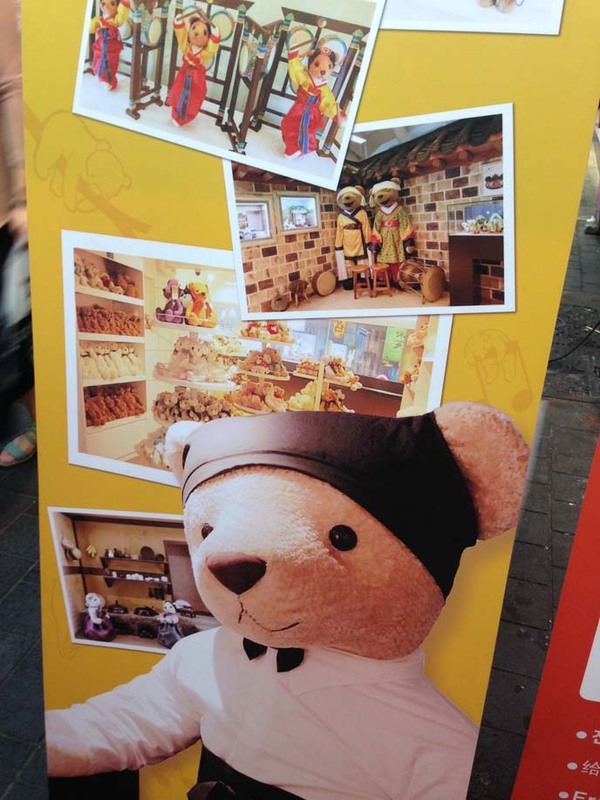 However, I came across some quirky places in Myeongdong, like this Teteru Teddy Bear Museum. Anyone can go into the cafe and gift shop for free, and pose with the giant, laughing teddy bears. There’s a small charge if you want to see the full displays of Teteru bears in the museum. On the streets, you’ll find strange street food. Unlike in places like Thailand and China, I’m not talking about organ meats and bugs on a stick. 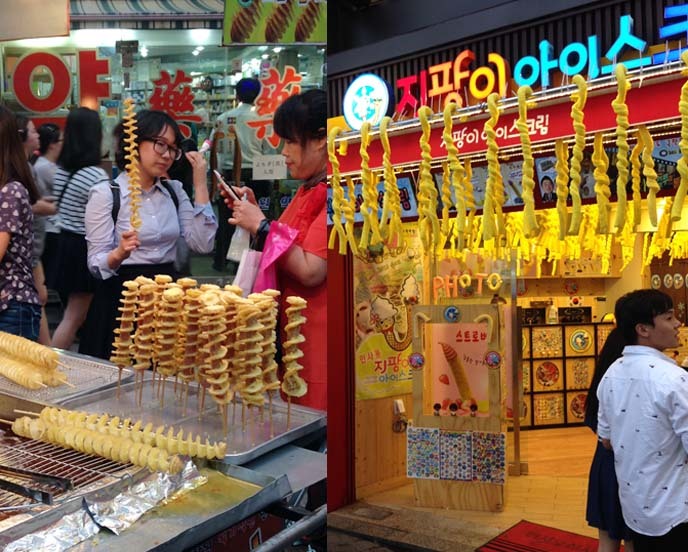 Seoul will serve you deep-friend potato chips on a stick, and ice cream in a vaguely phallic cone with a double-opening. 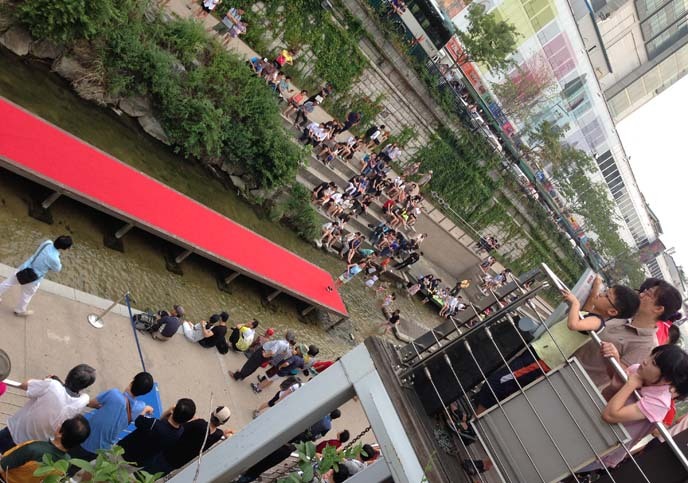 I leave you with a snap from a public fashion show at Cheonggyecheon. This is a 7-mile long open stream and urban space, where people stroll and hang out. Quite funny to see children playing in the waters, while models strut on the catwalk. 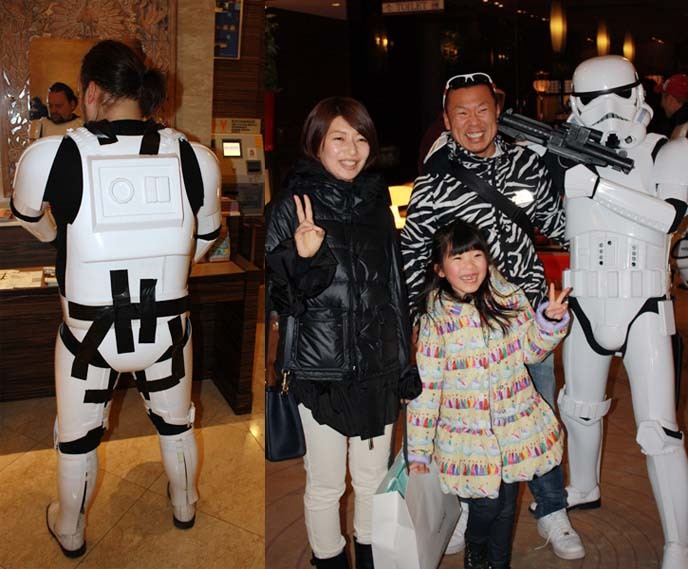 I hope these photos convey the pop culture energy of Seoul. 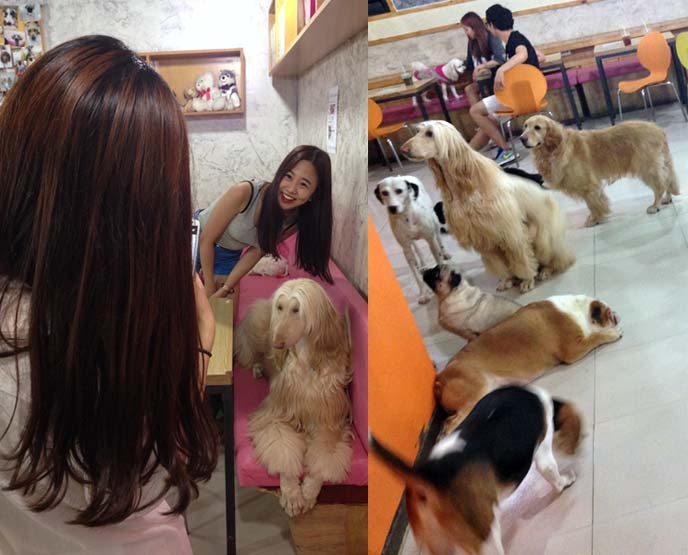 Would you visit a dog cafe, or Korean makeup shops? 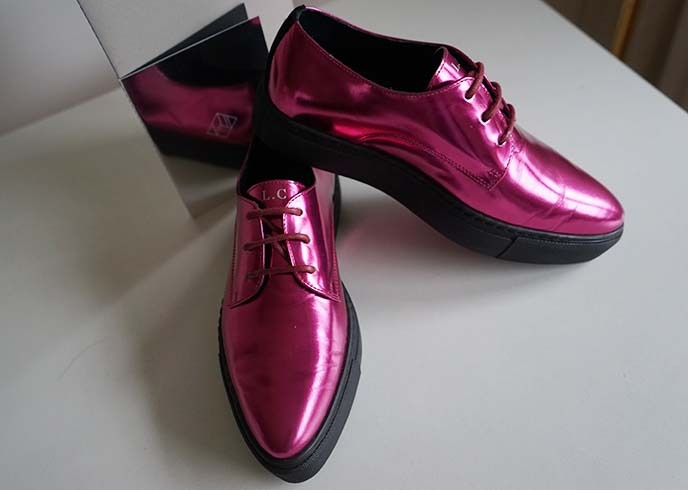 I think my MySwear derby shoes would fit right in with the Kpop fashion here! PS: here are all my Seoul alternative travel tips, to help you plan a trip to Korea. Off to Asia for a Travel Channel TV shoot! 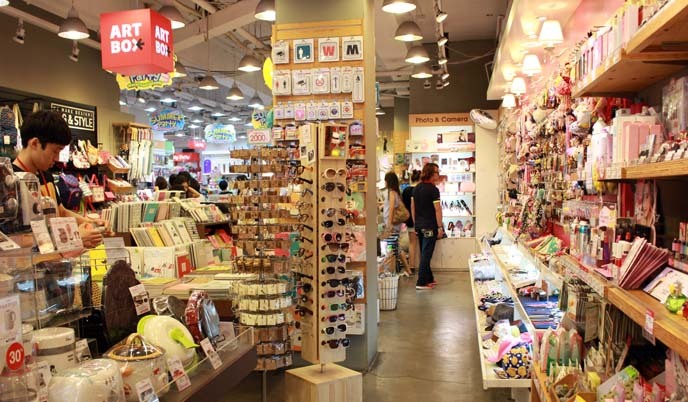 Cute Seoul Kpop shopping: Art Box, Etude House, Luxury Su Noraebang. 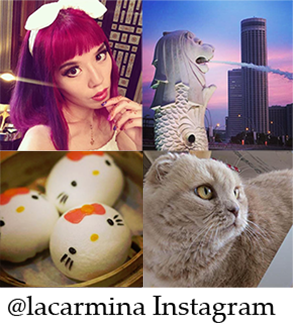 Over the past weeks, I’ve been giving you hints about my next Asian destinations. The photo above is probably the biggest clue of all! I’ll be in Tokyo this month, filming with Travel Channel for a new TV series! Plus Singapore and Bali! I’m thrilled to be part of a new Travel Channel TV show, which is being filmed worldwide. I can’t tell you much about it yet, due to contractual agreements — but I can hint that it involves Japan, a family, and all sorts of weird cultural activities. Don’t worry: I’ll fill you in before it airs, so you can tune in. After, I’ll be spending time in beautiful Bali, Indonesia. 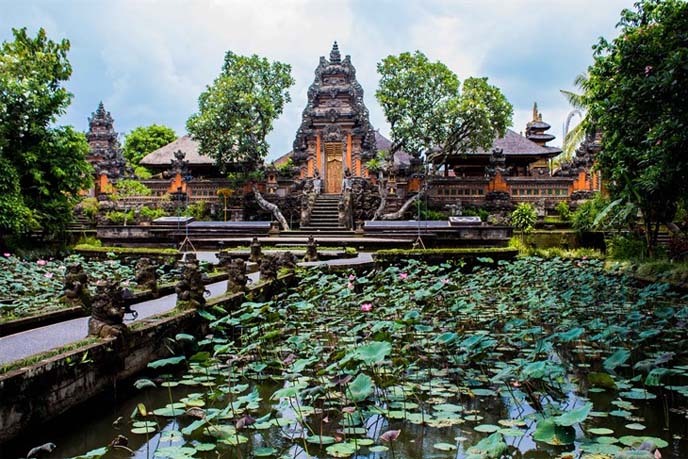 I can’t wait to explore the Hindu temples, rice paddies of Ubud, beaches… If you have Bali travel tips, please let me know as this will be my first time in this spiritual place. Until then, let’s take a look back at my Seoul travels last summer. Hongdae is hands down my favorite neighborhood in the city. It’s got an artsy, indie feeling that reminds me a bit of Harajuku. 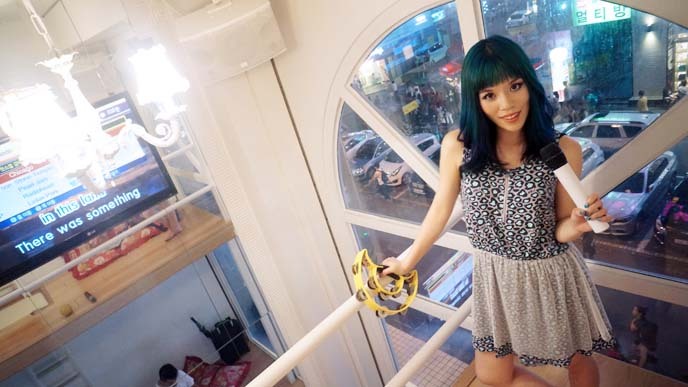 In a previous post, I checked out Hongdae’s graffiti, cafes and bars. 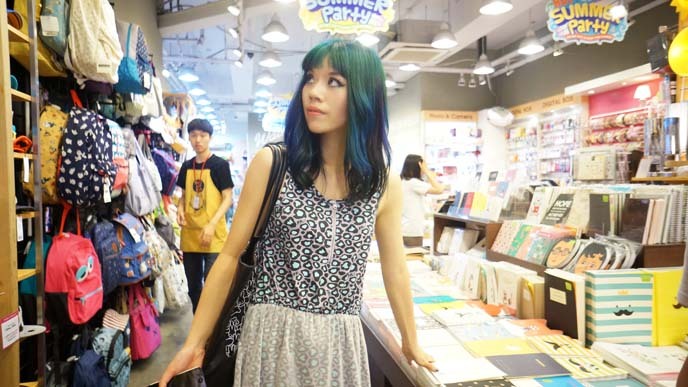 In this one, let’s explore makeup stores, cute-faced popsicles, and the latest Kpop fashion. I’m wearing a mint leopard print dress by Algonquins, found at Closet Child Tokyo. My Miffy bunny bag is from the Hong Kong Miffy shop. Remember Eat Your Kimchi Martina’s Hongdae map? She points out a street filled with parked cars. 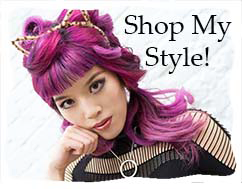 Some of the trendiest Kpop fashion is found here. Martina says that Kpop idols wear designs straight from these racks. I peeked inside Cat’s Living, a cat cafe located next to the Hello Kitty cafe. Locals come here to play with cats. There’s a Scottish Fold who lives there, of course! Mustoy (무스토이) is a must-visit, especially if you’re on a date or looking for somewhere to go on a rainy day. 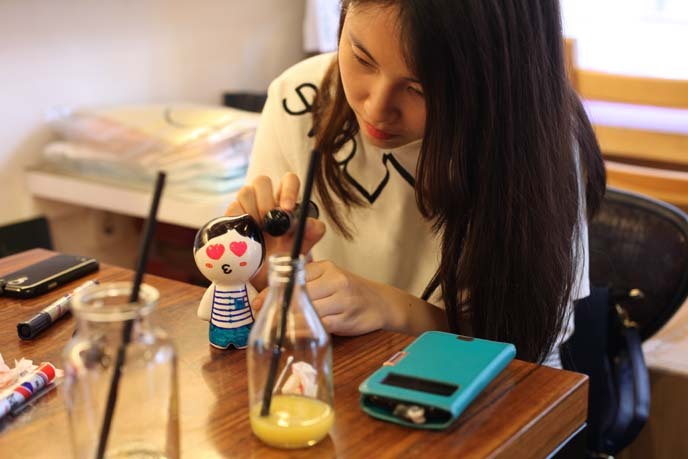 It’s a combination of an art studio and cafe, where you can customize one of these adorable figurines. For 15,000 won ($15 US), you can choose from one of several blank white ceramic toys, vaguely shaped like a person (or perhaps a cat). Now, it’s time to get creative. 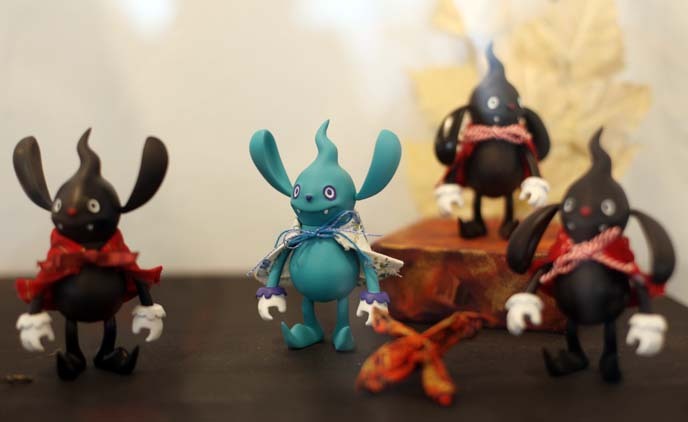 Using the colorful markers and other materials provided, you can transform the Mustoy into any creature of your liking. 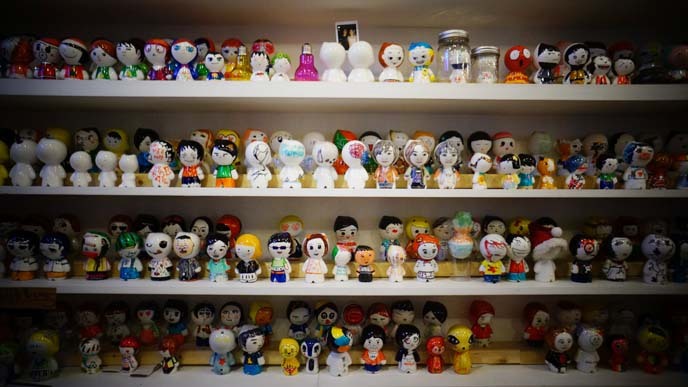 On the example shelves, I saw robots, Doraemons, bearded hippies, abstract figures — the only limit is your imagination. Once you’re finished, you can choose to take your new buddy home, or leave it in the store for others to admire or even buy. Wait, did I get teleported back to the Czech Republic? Nope, this is “Praha Castle,” a theme restaurant that re-creates Orloj, the astronomical clock in Prague’s main square. What a strange thing to see, in Seoul. My photographers and I stopped at one of the many dessert shops for a snack. 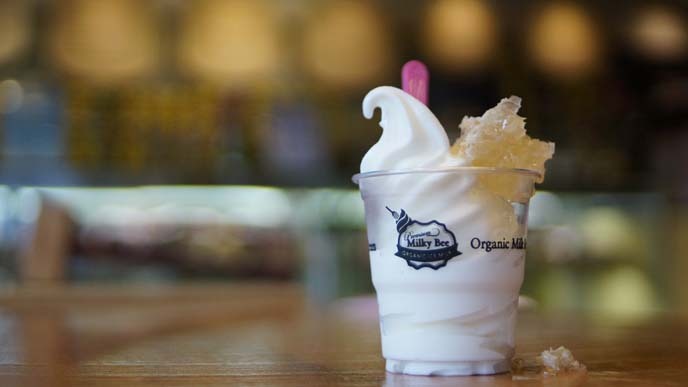 This is Milky Bee’s frozen yogurt with honeycomb on top. Koreans love sweets, and put trendy spins on them. In my Myeongdong post, I showed you the long two-headed ice cream cones. 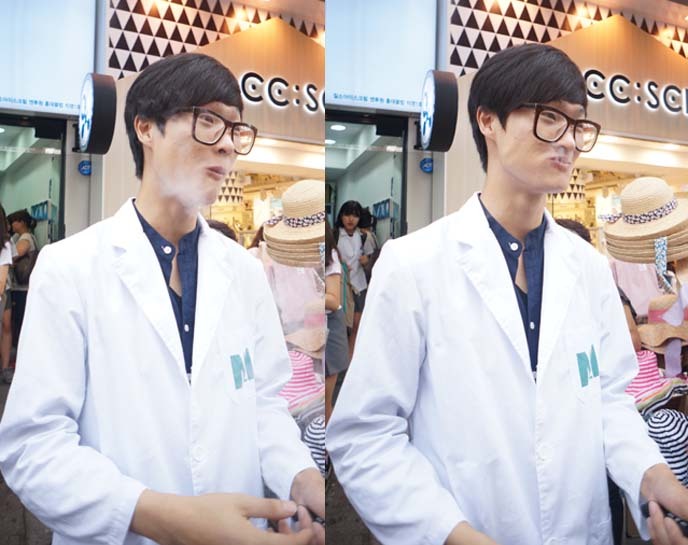 Hongdae’s youths are currently crazy about liquid nitrogen ice cream, which releases a cloud of vapor when you put it in your mouth. 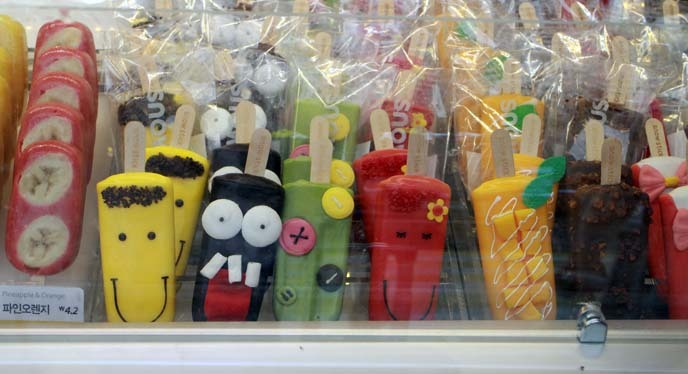 Another shop sold popsicles decorated with smiling faces. I wanted the chocolate Pirate one with an eyepatch, but it was sold out. 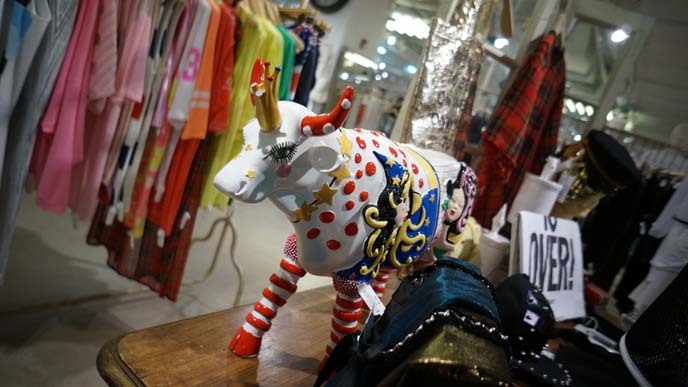 Art Box (아트박스) is the cutest gift store around. Stock up here on adorable Korean stationery and home goods — you won’t find these characters elsewhere. Your friends will be forever grateful if you bring them souvenirs from Art Box, like eyeball backpacks and moustache notebooks. 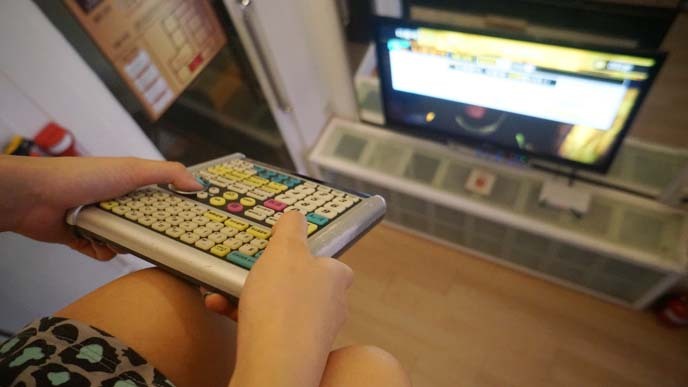 In Seoul, karaoke is “noraebang,” and it’s a better bang for your buck than in Tokyo. Prices can be as low as $8 US a person for all night singing in a private room. For a truly unique experience, go to Luxury Su Noraebang, located on one of the main shopping streets in Hongdae. It’s impossible to miss this big glass exterior — you can see people jumping around, singing and dancing inside! 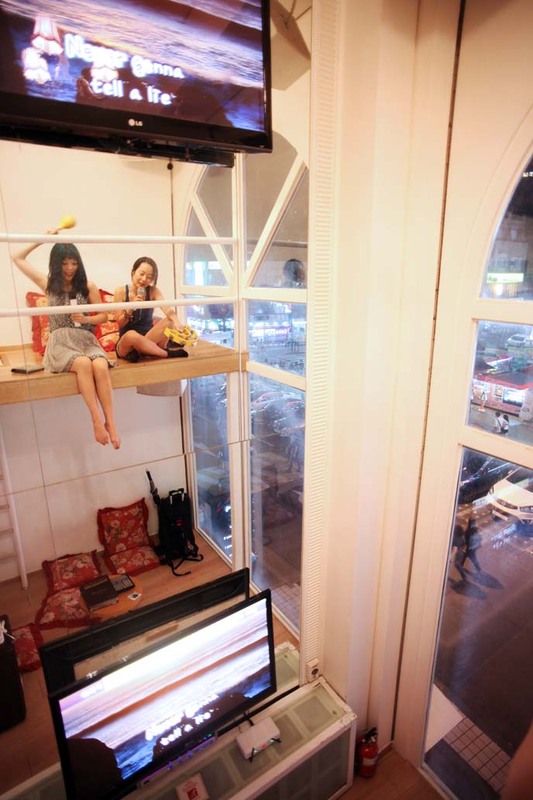 Ask for one of the “luxury” rooms with windows that overlook the street. We paid just $20 US total for an hour in this massive two-level loft. Can you tell what it is, from the karaoke song captions? It’s of course Bohemian Rhapsody, by Queen — one of the ultimate group sing-a-longs. The karaoke song system is in Korean, and if you don’t know the language, it may take a while to figure out. Try to find the button that changes the flag from Korean to British, and then you can search for songs in English by title, artist, or first words. Grab a tambourine and rock out to Journey, while dancing in the window and waving at curious observers below. Extra points if you can make them dance with you. Did we get Rick-Rolled? Can’t believe we had a two-floor loft to ourselves, with a ladder connecting the two! I’m sure a lot of people were amused by our antics, which they could see from outside. Photography by Jacqueline Kwok of noircorner, and Ken Yuen. Singing works up an appetite. 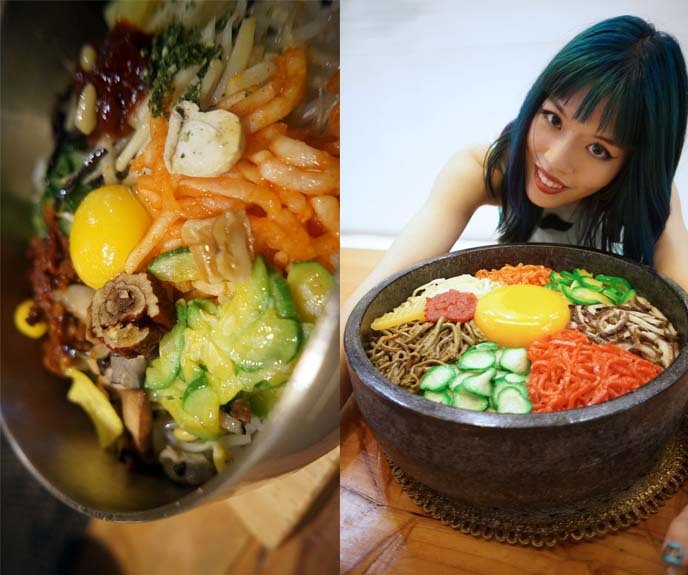 Where to eat, in Hongdae? There are restaurants everywhere, serving all types of international food. But when in Seoul, I say you might as eat Korean food. Try a barbecue restaurant, since this is a local specialty. Walk around and go with your gut when you select a place. I always look for restaurants with an authentic feel, and tables full of locals. 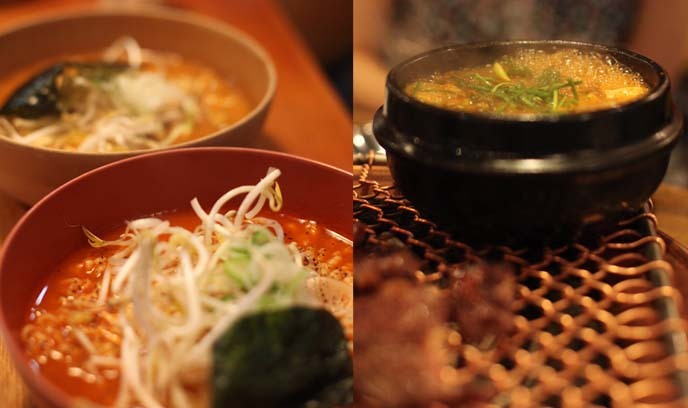 If you can handle spices, you’ll enjoy Korean hot noodle soups, and soon tofu bowls. 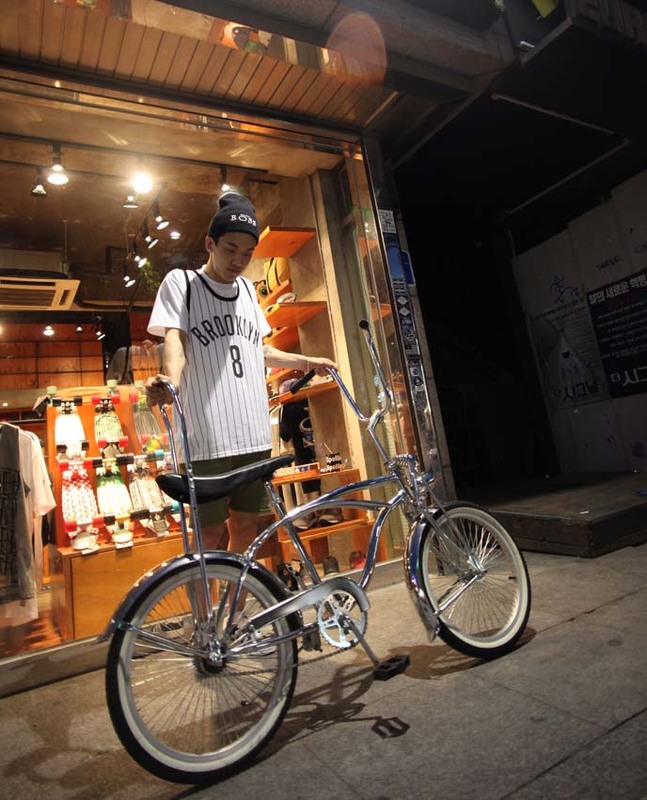 Ran into this fellow on a bicycle, dressed in Korean street style. We met so many kind people in Hongdae, who went out of their way to help us find directions. 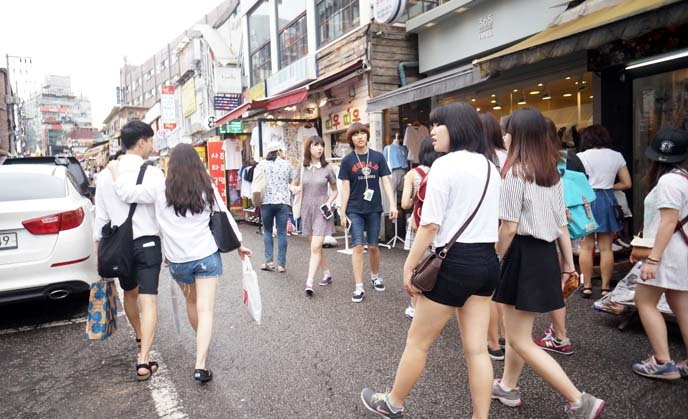 Young Koreans generally speak English. 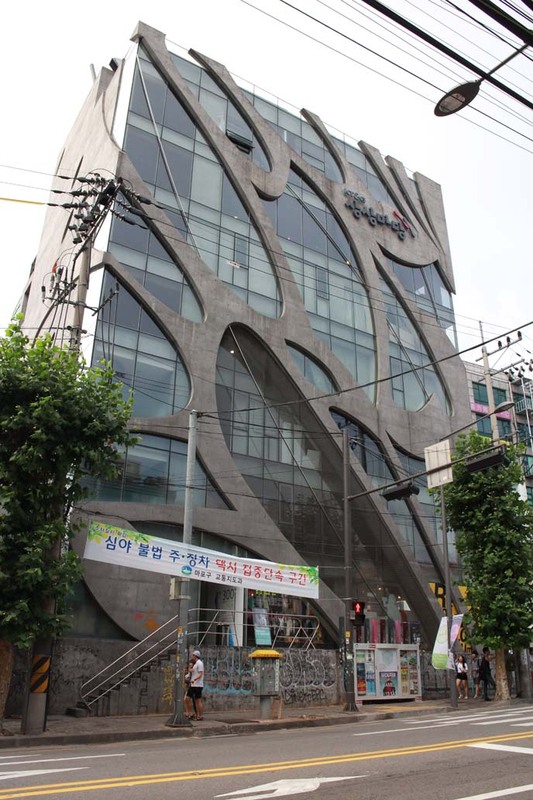 This is the remarkable Sangsangmadang（상상마당), a building that has a cinema, performance hall, art gallery, and design shop at the ground floor. Lots of clever design products in here, including some that are both beautiful and functional. 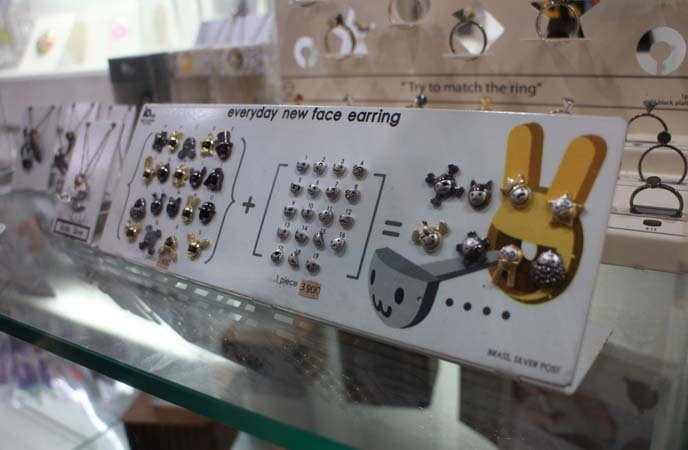 This, for example, lets you mix and match earring faces and borders, forming dozens of variations. If you’re having a bad day, you can have the frowny surrounded by bones! At the front, I saw display cases full of original figures. Are these peanut allergy monsters or something? I wish I could have taken my BobbyBox friend home with me. Now you can see why Hongdae is my favorite part of Seoul: it has so many cute shops and offbeat attractions. 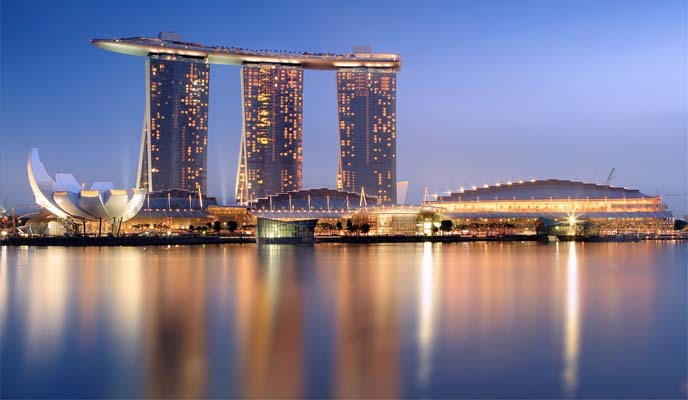 And please let me know your suggestions for Singapore, Bali and Tokyo! 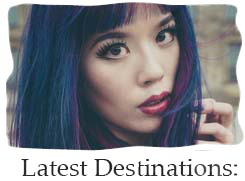 You’ll be able to see sneak peeks of the Travel Channel TV shoot and more, on my Instagram @lacarmina.